In addition to the mass mobilization of foreign workers, the Nazis increasingly used concentration camp prisoners as forced laborers during the war. SS-owned companies such as the German Armaments Works [Deutsche Ausrüstungswerke or DAW] and the Society for Textile and Leather Processing [Gesellschaft für Textil- und Lederverwertung or Texled] exploited the prisoner labor force. In September 1942, after several months of negotiations, the SS Economic and Administrative Main Office [SS-Wirtschafts- und Verwaltungshauptamt] and the Armaments Ministry, led by Albert Speer, reached an agreement whereby the employment of prisoners was extended to the armaments industry. From that point on, companies were allowed to “lease” prisoners from the SS for a fee and exploit them as cheap labor. Satellite camps were set up near factories for this purpose. In late 1944, approximately 500,000 concentration camp prisoners were being used as forced laborers. 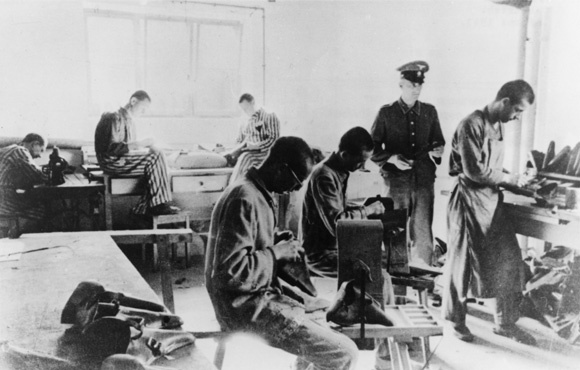 The photograph shows a camp guard watching over Dachau prisoners as they perform slave labor. In addition to a Waffen-SS clothing factory, the SS ran factories for the German Armaments Works and the German Foodstuffs Association [Deutsche Lebensmittel GmbH or DLG] directly in the Dachau camp. It also oversaw the “plantation” (herb garden and agricultural field) of the German Laboratory for Nutrition and Food [Deutsche Versuchsanstalt für Ernährung und Verpflegung or DVA].